Niagara Falls, NY - Hyatt Place Niagara Falls General Manager Stacie McDonald, center and Sarah Wyzykiewicz, sales and catering manager, left, talk with job applicant James Fallin, who hopes to find local work after returning to the area after being away 16 years, he said. Governor Andrew M. Cuomo and Mayor Paul A. Dyster sponsored the job fair at the Conference and Event Center Niagara Falls. 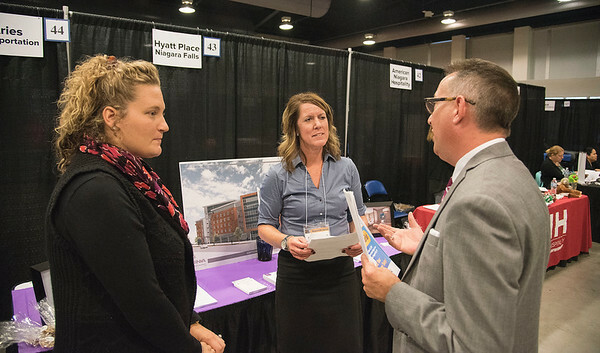 Attendees had the opportunity to connect with more than 80 potential employers.